Since our arrival on the island, CTSC ministry has evolved into many facets. One is a building program based on needs of different churches on Roatan. Helping both with teams and finances, CTSC has been involved in the construction of a new sanctuary at Mt. Pleasant Baptist Church. With CTSC funds, volunteers and islanders constructed The Net, a youth center in the Flowers Bay community. Most recently, a group of men from the southeastern U.S. worked alongside men from the community to construct a seawall to protect the shoreline behind the Flowers Bay Baptist Church. 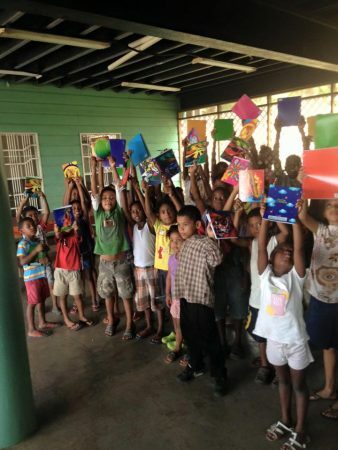 One of our most joyous opportunities to serve is the Roatan Children’s Christmas Parties and gift distribution. Throughout the year, volunteers bring extra luggage packed with toys, books, school supplies and treats. Excited children form lines in their communities to see a nativity drama and receive toys. At the Net, balloons, cupcakes, a pinata and the story of Jesus’ birth provide an overwhelming Christmas experience for Roatan children and their parents.